Tell me about VIP Packages? 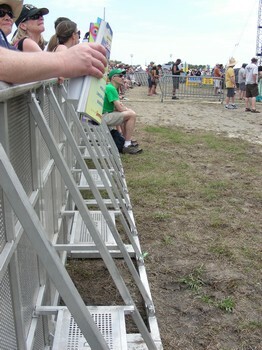 The Big Chief VIP package provides elevated, covered seating at the main stages. The Grand Marshal VIP package gives you access to a private front-row standing area (no chairs allowed). 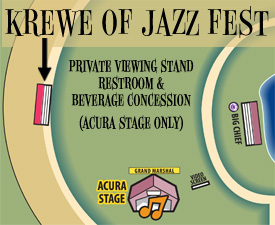 The Krewe of Jazz Fest VIP package gets you private, elevated seating at the Acura Stage only. Think of it as a one-stage Big Chief. Grand Marshal and Big Chief offer hospitality areas with complimentary snacks and a cash bar. Here's the latest 2019 pricing (it's changed a few times). VIP ticket packages are inclusive of all per-ticket charges, but there is a $25 shipping fee for the whole order. Each VIP ticket covers all the days of either 1st or 2nd weekend; there are no single-day VIP tickets sold. Unlike general admission tickets, VIP tickets are limited in number, and do sometimes sell out, though not right away. The map on the right shows the Acura stage VIP area locations. Unlike GA tickets, all VIP tickets do offer same-day re-entry privileges. Are the VIP passes transferrable? Only one person may use the pass on a given day. You can't use the pass early and then hand it off to someone else later in the day. The passes are transferrable across days, for example, you could use a pass on Friday and Saturday, and a friend could use it on Sunday. But... the pass is delivered as a single laminate. When you enter each day, they punch or scan the laminate and give you a wristband for that day. You need both the wristband and the laminate to access the VIP areas. This means that if you do plan to transfer the pass, you'll need to hand it off at the end of the day; you can't, for example, mail someone the Sunday pass in advance while keeping Friday and Saturday for your own use. What is Grand Marshal like? Just how close are you? Pretty close. Basically, you're right behind the photo pit. This is the Grand Marshal area at the Acura stage (early in the day, so not yet crowded). These seats are built into the rear fence of the Grand Marshal areas. Grand Marshal is SRO, and you're not allowed to use your own chairs. So these seats are your only option to sit, within the area. 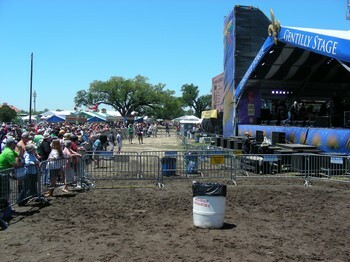 This is the Gentilly stage. The foreground, with the white trash can, is the "Guest Area" (you have to know someone to get a pass here). The mostly empty area past the fences, stage center, is the Grand Marshal area. Grand Marshal areas are located at the three largest stages at the fest: Acura, Gentilly, and Congo Square. One other note about Grand Marshal: for a few acts, detachable-lens cameras may be restricted, for example, to the first few songs of the set. Fixed-lens (point-and-shoot) cameras and cell phone photography are always allowed. What is Big Chief like? How far away from the stage is it? Big Chief customers have access to raised and covered private viewing areas with beverage concessions and restrooms at two of the Festival’s main stages, Acura and Gentilly. Seating is first-come, first-served. At three other stages, Big Chief ticketholders will have semi-private access to a viewing area at the Congo Square Stage, the Jazz Tent and the Blues Tent. Aerial shot of the Acura stage. The Big Chief VIP seats are under the white roof on the left of the picture, halfway down. Here's a pic I found showing the Big Chief seats, also at Acura. I took this picture standing right in front of the Acura stage Big Chief stands. 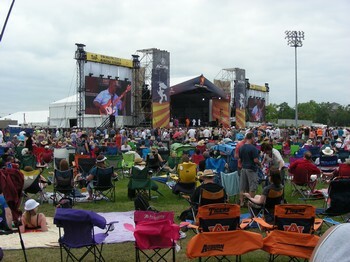 In the Jazz and Blues Tents, the Big Chief seats are bleachers, located on the side of the tent about halfway back. There's a separate entrance into the Tents for Big Chief, which means you can get in, even for the really popular acts, when the Tents fill up and the entrances get jammed. Big Chief also offers access to a Private VIP Hospitality Lounge (located in the building between the Grandstand and the Gospel Tent), where Big Chief patrons can "renew and revitalize with complimentary light refreshments" and restrooms. What is Krewe of Jazzfest like? How far away from the stage is it? The distance to the stage is about the same as it is from the Big Chief stands. 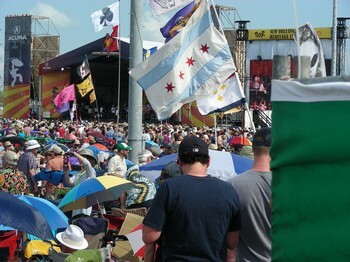 Unlike Big Chief, Krewe of Jazzfest stands are found at only one stage, Acura (the "main" stage). This picture was taken standing next to the Krewe of Jazzfest stands. 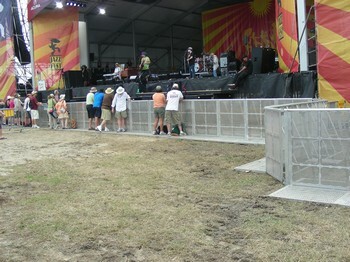 The green fence on the right of the picture is the front corner of the Krewe of Jazzfest area. The seats themselves are similar to the ones in the Big Chief stands, and both are elevated for better viewing. Behind the stands you'll find private trailer-style ("crowd pleaser") bathrooms, and a dedicated beverage sale booth. 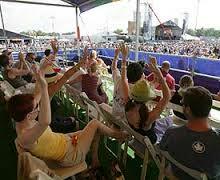 Unlike Big Chief, Krewe of Jazzfest does not include hospitality lounge access.